Every living being accumulate bad karmas by their body, speech and mind. 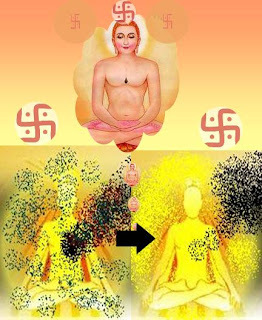 According to the Jain Tradition a person can accumulate more karmas by his/her mind than body and speech. According to the last and 24th Tirthankar Lord Mahavir, if someone thinks or desires to kill any living being and he has not applied yet then he has accumulated the karmas of killing a living being. It is not important that he hasn’t killed physically but he has killed the living being mentally. His thoughts create vibrations that cause the microscopic particles to disturb and the particles makes creates such situations that the person who first thought to kill will somehow kill the opposite person in future. The time depends on the vibrations of his thoughts. It can come in action in his present life or in his next births. Here is a good example how violent thoughts can be harmful to the soul. In ancient Jain scriptures there is a story of a monk who is walking in a jungle in darkness. He cannot see on the ground because of darkness. He is walking on a dry leafs and grass. He felt it and imagined as if he was walking on insects. Instead of stopping himself he continued walking with thinking and imagines that he is walking on insects. In fact he was walking on the grass and leafs. As a result he accumulated deep karmas of killing thousands of insects just by his thought and because he didn’t stopped him to walk there. He also never confessed about that and after completing his life he went to the hell and after that he went to the infinite cycle of birth and death. He washed out his chance of liberation! From the above fact we can see that how destructive are thoughts. Jainism has given more importance to control of mind. Even Lord Buddha has said the same and has given more importance to control thoughts first. Recently I have read the book “The Secret”. The book deals on the importance of thoughts but saying that to accomplish your wish you should imagine mentally about your dream so the nature will create it for you! But there is not mentioned that how much time would it take? It can fulfill your dream before you die or in your next birth! The same thing has been mentioned in both Jainism and Buddhism. Both founded by the omniscient lords and is hundred percent correct. Instead of saying “to desire” these religions has the concept of “stop desires”, and control your emotions if you want liberation. Because your dreams and desires will extend your soul’s existence in mundane world. The main aim is purify your thoughts to destroy and accumulating new karmas.